Although this detail is often overlooked, in many cases cannabis growers can increase their yields and potency simply by keeping their grow lights just the right distance from their plants! How far away should you keep your grow lights for the best cannabis yields and potency? 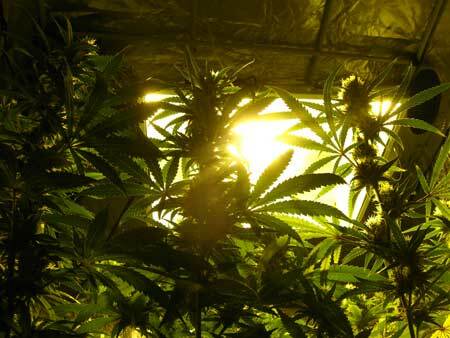 Cannabis plants capture energy from light and use it to grow bigger buds. In order to maximize your cannabis yields you'll want to give your plants as much light as possible, but without causing light burn. In other words, you want to increase light levels but without going overboard! 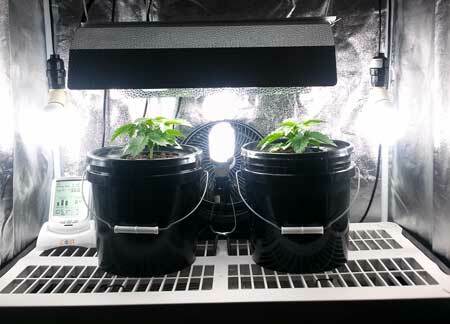 While standard fluorescent grow lights like T5s and CFLs simply don't produce enough light to overload your plants, powerful lights like HPS and LEDs can do so with ease. Although LED and HPS grow lights can produce the biggest yields and most potent buds of all grow lights, they need to be used correctly to get those results! By using powerful lights like LEDs or HPS and positioning them the right distance from your plants, you'll create the highest levels of light your cannabis plants can use! Put your buds in this "sweet spot" light level zone, and they'll reward you! 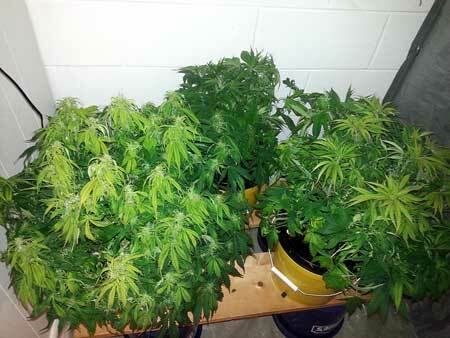 Notice with these plants how all the top buds are big, while the lower buds are smaller. You want to keep grow lights close, because buds closest to the grow light get the biggest! More light is better when it comes to yields, but unfortunately that's only up to a point. Although it may be tempting to keep trying to move grow lights closer and closer, your plants simply can't use more light past a certain point! In fact, if you keep your lights too close to your cannabis plants, you'll see bleaching, yellow leaves and nutrient deficiencies, so it's important to find a balance! Keeping grow lights too close hurts your plants! These plants were too close to their LED grow lights and their top leaves started getting bleached from light burn! Each type of light needs to be kept a different distance away, so if you feel confused this tutorial will show you how far to keep your grow light so you get incredible results every time, no matter what your setup! Increase Marijuana Yields Even More With Training! Tip: In addition to knowing the right distance to keep your grow lights, many cannabis growers can increase their yields even more by using plant training to take advantage of that "sweet spot" where plants are getting the best amount of light. Training plants to grow with many colas of the same height (like the cannabis plants pictured below) allows dozens of buds to be the same distance from the grow light, so all the buds can be in the sweet spot at the same time! 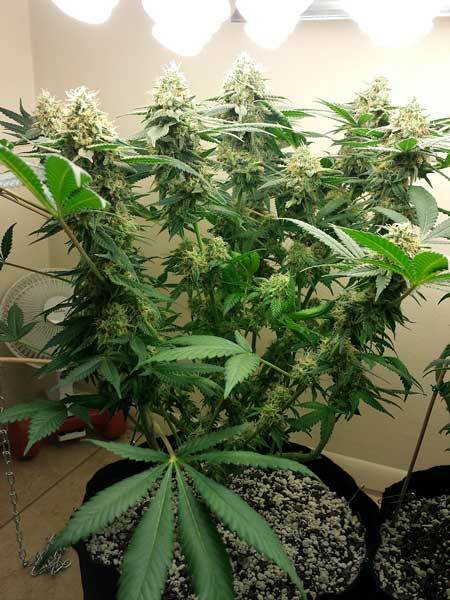 Get many colas close to the light for the best yields! HID grow lights like Metal Halide and HPS (High Pressure Sodium) are the most widely-used and debatably the highest-yielding grow lights available for growing cannabis. 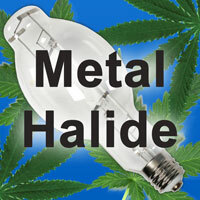 Metal Halide lights are well-suited to the vegetative stage and tend to encourage plants to grow short and squat though they are less electrically efficient than HPS. HPS lights are suitable for both the vegetative and flowering stage of cannabis growth and the light they give off encourages plants to quickly grow tall and produce big buds. Depending on the size/wattage of your light, MH and HPS grow lights need to be kept at different distances from your cannabis plant. 1000W - covers 4' x 4' (1.2m x 1.2m) area up to 5' x 5' (1.5m x 1.5m). However, in addition to the wattage, it's important to realize that older bulbs stop giving off as much light over time, so new MH/HPS bulbs generally need to be kept further away and older bulbs should be kept closer than the normal recommendations. If you're using new bulbs, never start closer than the "~Sunlight" distance and only move lights closer if your plants are stretching towards the light (getting tall and lanky). If you're using older MH/HPS bulbs, you should replace them if you can, but if that's not possible you can keep your bulbs closer to help make sure your plants are still getting good light levels. 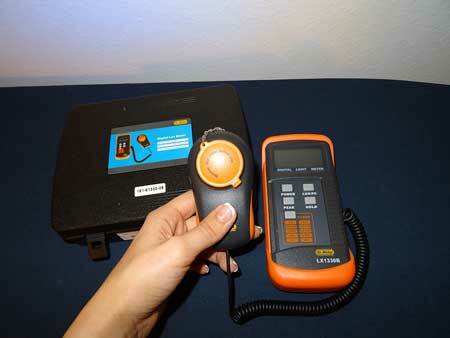 This is why it's beneficial to be able to test your current light levels with a lux meter. In general, MH bulbs need to be replaced about once a year (every 2-3 grows), while HPS grow lights last a bit longer, up to 2 years (every 4-5 grows). Older HID bulbs give off less light and more heat! So in addition to keeping the right distance, make sure you're aware of the age of your bulbs! 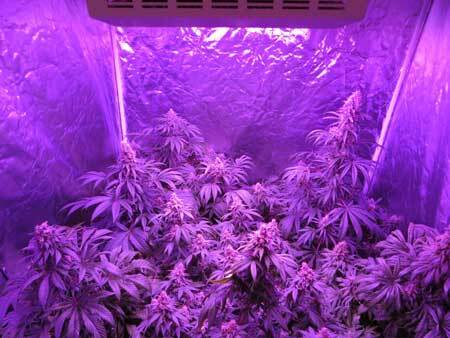 LED grow lights are powerful and can get great yields when used correctly. 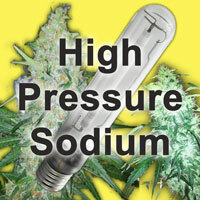 But when growing cannabis with LED grow lights it can be a little tricky to get the distance just right. Unlike with MH/HPS grow lights, there is no "standard" distance to keep each LED grow light and it's hard to summarize with a quick chart like with MH/HPS. The distance needed between an LED and the top of the plants varies quite a bit from model to model and from manufacturer to manufacturer. Many things can affect the optimal distance from plants, including the individual size of each LED bulb and the way the manufacturer used lenses to reflect light downwards at your plants! Contact the Manufacturer If Possible - Ultimately when it comes to LED grow lights, the best thing to do is contact the manufacturer to see what they recommend as far as distance from the tops of plants. If in doubt, keep LEDs further away - It's very common for cannabis growers to believe that as long as the temperature is under control they can keep LED grow lights as close as they want. Unfortunately this is not true. Although LED grow lights run cool, the LEDs available today give off an intense amount of light which is great for yields, but can give your plants light burn if kept too close. The reason this can be such a problem with LEDs is it can take a few weeks before your plant really starts to show symptoms. 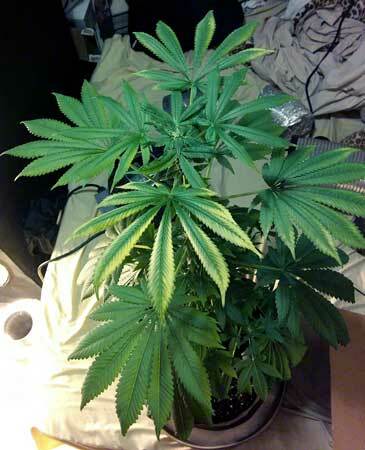 Usually the upper leaves are affected first (yellowing or turning brown or spots) by too-close LEDs, but symptoms can also affect other parts of the plant. Keeping LEDs Too Close Can Give Your Plants "Sunburn" That Looks Like a Nutrient Deficiency! As long as it's not too hot, you basically can't give your cannabis too much light with these types of grow lights. So with fluorescent grow lights the idea is to keep your plants as close as possible as long as it passes the "hand test." In other words, your lights aren't too close as long as you can put your hand where your plants are for 30 seconds and it doesn't feel too hot for you. 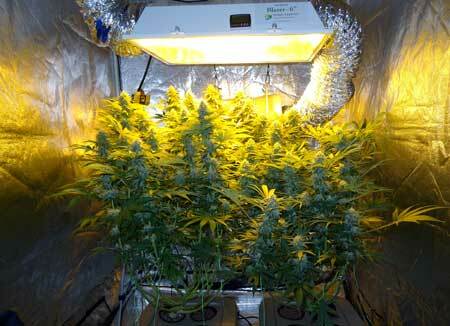 Keep Fluorescent Grow Lights As Close As You Can to Cannabis Plants Without It Getting Too Hot! 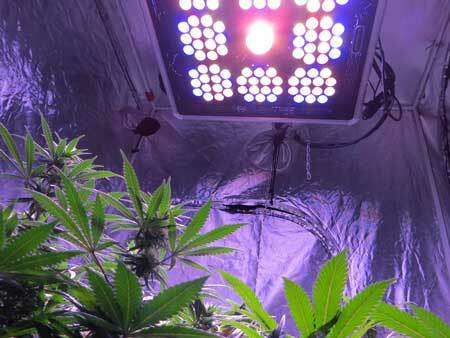 With fluorescent grow lights, it becomes even more important to learn how to use plant training techniques as you will need to train your plants in order to achieve an even canopy and get good harvests. 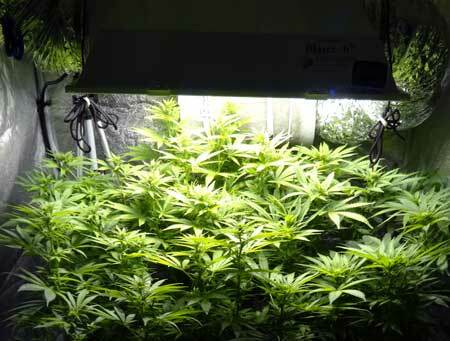 But with good training, you can grow cannabis under CFL grow lights that look like this! Or T5 fluorescent lights to grow cannabis like this! If you have a Lux Meter to measure your brightness levels, you can get even more accurate with your grow light distance. A Lux meter isn't a perfect measurement of light because "lux" isn't exactly what matters to your plants (lux is a measure of light as humans see it). However, a lux meter is accurate enough for indoor cannabis gardening when it comes to fluorescent, CFL, MH and HPS grow lights! Note: Unfortunately, a lux meter is not a good tool for estimating the brightness of LED grow lights. That is because lux meters have been "calibrated" to be accurate for incandescent light bulbs. Although this is close enough for fluorescent and HID lights that it doesn't matter to your plants, the unique color spectrum of LED grow lights doesn't translate well when the lux meter is trying to measure light levels.